I don’t know about you, but I was not always a veggie fan. I wasn’t raised on vegetables and didn’t eat my first salad until I was in my 20’s! 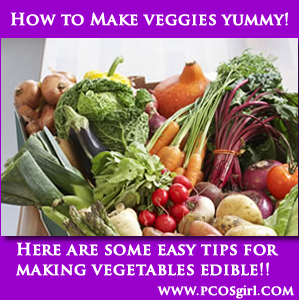 I now know the importance of eating healthy to keep my PCOS symptoms mild. Vegetables are the key to being healthy and losing weight. Another option for all veggies below is to substitute the salt and pepper with a packet of dry salad dressing mix (Ranch or Italian flavor). The options below are for veggie beginners, I tend to only focus on a handful of popular vegetables. I encourage everyone to try any and all the vegetables they can, not just limit themselves to the veggies below. Asparagus – Preheat oven to 425*, line baking sheet with foil, lay out asparagus spears on foil. Drizzle olive oil over spears and sprinkle sea salt and pepper over spears. Roll spears around on foil so they all get coated. Cook for about 15 minutes. Brussels Sprouts– Preheat oven to 400*, line baking sheet with foil. Toss brussels sprouts whole (or cut in half) onto sheet. Drizzle olive oil over sprouts, sprinkle with sea salt and pepper. Roll sprouts around in olive oil to coat. Bake for 20 minutes or until crispy. Sweet Potatoes (Savory)– Preheat oven to 400* Slice sweet potatoes into thin strips or small chunks (like a Hershey Kiss). Place on foil lined baking sheet. Coat with olive oil, and then sprinkle sea salt and pepper. Roll to thoroughly coat. You can add extra salt after cooking if needed. Bake for about 45 minutes (until tender). Sweet Potatoes (Sweet)– Preheat oven to 400* Slice sweet potatoes into thin strips or small chunks (like a Hershey Kiss). Spray baking sheet with cooking spray. Lightly coat olive oil, then coat with honey, sprinkle cinnamon and a tablespoon of sugar. Roll to thoroughly coat. Bake for about 45 minutes (until tender). Kale Chips– Make sure kale is dry! Preheat oven to 350*. Line a baking sheet with foil and spray with cooking spray. Spread cut kale (cut like size of a potato chip) over foil. Spray with olive oil, or lightly coat with olive oil. Sprinkle sea salt and pepper over pieces. You can also play around with other seasonings. Bake for about 10 minutes. As soon as kale tips start browning, they are done! You don’t want the, chewy, but you don’t want them burnt! Green Beans– Preheat oven to 400*. Line a baking sheet with foil. Spread green beans (long thin ones taste best). Coat with olive oil, dry ranch dressing powder (single packet). Roll around to thoroughly coat. Cook for about 30 minutes. Panera Bread bottled Balsamic Vinaigrette– Use this dressing on any salad, this is my favorite salad dressing. You can buy it at most grocery stores, in the produce section. Ranch Dressing– Carrots, Zucchini, Cucumber, red/orange/yellow peppers, steamed or fresh broccoli, steamed or fresh cauliflower, and celery. BBQ or Steak Sauce (pick a healthy one- no high fructose corn syrup! )- Steamed or fresh broccoli, celery, and steamed or fresh cauliflower. Buffalo Sauce- Baked Cauliflower florets- See BBQ Recipe Here and Buffalo Sauce Recipe Here. Pasta Sauce– Super yummy! Cook with veggies on stove, or dip veggies. Good with carrots, broccoli, cauliflower, zucchini, and green beans. Broccoli– Steam broccoli or cauliflower in microwave. Remove broccoli and place on a plate, add your favorite cheese and microwave for like 30 seconds or until cheese is melted. Tomato– Slice tomato in half, sprinkle on some salt and add a slice of cheddar cheese. Buy yourself a good mixer, Nutribullet Pro , Magic Bullet, Vitamix, Ninja- whatever you can to blend! Make a daily smoothie using frozen vegetables. You can barely taste frozen veggies in smoothies! Start with a 70% fruit, 30% veggie smoothie and gradually increase until the portions are 80% veggie and 20% fruit. The following frozen veggies are hardly detectable via taste in smoothies- spinach, kale, squash, cauliflower, and carrots. Spinach Smoothie– Frozen: chopped spinach, kale, banana, blueberries, and strawberries. Once all veggies/fruit is added. Pour water into mixer until fruit is covered. You can substitute water with coconut water or almond milk for a thicker, sweeter taste. Pineapple Smoothie– Frozen: chopped spinach, banana, pineapple, peach, and a liquid choice (see above). Kale Smoothie– Frozen: chopped kale, avocado, banana, spinach, pineapple, cauliflower, strawberries. Pour water into mixer until fruit is covered. Smoothie add-ins include: pumpkin puree, ceylon cinnamon, flax seed, peanut butter, almonds, and chia seeds. Mix in as desired. This should be a great veggie kick off point! This entry was posted in PCOS, PCOS Friendly Recipes, PCOS Symptoms & Meds, PCOS Weight Control.